The Nook Touch with GlowLight has been out for a little over two weeks now. The first week a few developers that knew what they were doing were able to root their Nook Glow with a manual rooting method, but that is a little advanced for most people, including myself (Windows doesn’t make it easy). Luckily there’s now a super-easy method for rooting the Nook Glow thanks to a package called TinyNoot that was put together by Roustabout over at XDA from tools the community has developed in the past year since the Nook Touch was released, including CWM, MinimalTouch, and Touchnooter. The package doesn’t include Google apps (here’s an install guide for GlowNooter, which does have Google apps), but TinyNoot does root the Nook Glow and installs some important apps needed for a rooted Nook Touch, and comes with the Amazon appstore for easy access to apps. Check out this review of the rooted Nook Glow for a video showing it in action. After getting things setup with Amazon, I downloaded the Opera Mini web browser and was able to download some additional apps not available from Amazon through alternate appstores. All in all, TinyNoot does pretty much everything a regular rooted Nook Touch can do minus the Google apps. Plus the GlowLight works! I was eagerly waiting for something like TinyNoot to come along for the Nook Glow and it is surprisingly easy to use. Here’s my version of the install instructions; the original thread can be found at XDA. If you want to have access to Google’s appstore, use this alternate rooting guide for GlowNooter instead. It is strongly advised that you create a backup of your Nook Glow before rooting it or modding it in any way. A backup essentially creates a snapshot of your Nook in its exact current state so you can revert back to it if something goes wrong after rooting or if you want to un-root. 1. Download a clockwork-rc2.zip file from over at XDA to your computer and then extract it. Inside you’ll find an image file. I’m using a 2GB card so I used 2gb_clockwork-rc2.img. 3. For Windows, open WinImage as administrator and Select Disk > Restore Virtual Hard Disk image on physical drive. Select the microSD card from the list and hit OK. Now locate and select the clockwork-rc2.img file to open (make sure to select “All files” from the drop-down list to get img files to show up). After hitting Yes, WinImage will write CWM to the microSD card. 4. Once that’s finished, download these two TinyNoot files and then place them on the CWM microSD card you just created; don’t extract the TinyNoot zip files. 3. Now select “choose zip from sdcard” and install the tinynoot-1-of-2-.zip file first to root. Scroll down to Yes to confirm. 4. Once that’s done “choose zip from sdcard” again and then install the second tinynoot package, 2 of 2. 5. After both TinyNoot packages are installed, use a left button to back out to the main CWM menu and then remove the microSD card and select to “reboot system now”. Tip: Once your Nook Glow loads the first time after rooting, make sure to check the small box when asked to “complete action using” and then select ADW launcher. That way you can get to the Android homescreen by default and use the “n” button to bring up the menu to go to the regular Nook’s homescreen. Tip #2: Before you can install any apps, you need to open the Nook Color Tools app and then uncheck and recheck the “Allow non-Market apps” box. Here’s a video tutorial for those of you unfamiliar with how CWM works, along with a couple of getting started tips. I’ll post an in-depth video review showing the rooted Nook Glow in action in a day or two. Update: here’s the link to the rooted Nook Glow review, plus tips and tricks post. It includes a 10 minute video showing the rooted Nook Glow in action. zip 2 does include the mount commands, though, so it may be possible to run the two commands back to back, but the advice from the developers of minimal nooter, which my method derives from, is to do a reboot between the flashes. It may be possible to collapse both of my files into a single installer. It would take me some time to test that, though. Thanks for the heads-up Roustabout. I added 3b to the directions about rebooting to be on the safe side. I did it twice without rebooting (I screwed up the first video and had to start over again) and it worked okay, the re-mount must be doing the trick. You devs are amazing. Thanks for the post Nathan. If only I had a PC instead of a Mac. Also, thanks for your 10.1 inch tablet advice. Much appreciated. I think I will go with the Asus. FYI, I’m not a dev so much as a cobbler. I’ve had about one original thought. This rooting package is cobbled together from the minimal touch team’s packages and from various Android apps. The most reliable way to do it on a Mac will be to open up the terminal and use dd. Thanks for the info roustabout! I was under the impression that only PC users could tinker with this stuff. I will take a look. Again, you are still amazing! Thanks! I might get the Glowlight Nook Touch and root it, but I want to be sure of its capabilities first. It has am infrared touch screen, a virtual keyboard, wifi, a browser, and runs Android 2.0. It cannot play audio. Can it read, send and compose E-mail? Can it run Froyo or higher, and can it handle useful Android apps? The iRiver Story HD is an android device, but there’s not much of a modding community around it. It has a 1024×768 display, though – the NST/NSTG/Kobo Touch all run 800×600. I think you must be referring to the Kobo Touch? The up side to the Kobo is that a lot of things which require root on the NST are apparently just there – a web browser, for example. There is a modding community for the Touch, mostly focused around the mobilereads forums, it looks like. ICS isn’t available for any e-ink device that I know of. The NST/glowworm are running android 2.1, not 2.0 and are the group of devices I know most about. There was a while when I was running gmail on my NST, but abandoned that – others still do. Be aware that until gapps are ported to the glowworm, mail client support won’t include the gmail app but looks to include k9 and other mail clients. On the NST, USB host mode has been enabled, meaning you can attach a keyboard. The USB host mode, combined with a USB to bluetooth dongle, opens up support for audio; there’s an active project on the host mode support over at XDA and there is a dev working on audio – the nice thing is that a lot of the Android kernel was left intact. My impression is that host mode is still kind of buggy and probably won’t be available for the glowworm for a bit. On the up side, the glowworm is selling fast so there may well be a resurgence of devs with the devices – or not, because the straight NST is so cheap now that that may get more focus. Have you determined if this affects battery life yet? I’d go with the gloworm for its E-ink, touchscreen and Android system. I wouldn’t bother about audio or an external keyboard. It should have a virtual keyboard, right? I can do without the E-mail, just having reading and writing would be fine. This is a great article. I tried it step by step and I can get all the way to the rebooting part. However, when I boot er’ back up my NST/G just flashes the glow light on and off and never gets past the screen with the five dots. I tried a factory rest (holding the two lower bars and all) and I still can’t get past the “5 dot” load screen. Any help with this would be greatly appreciated. Oh, and if it matters I tried the TouchNooter.img before I tried the TinyNoot steps here. Perhaps that is how I messed it up. If I can’t figure this out I have a pretty expensive rectangular coaster. Sigh..
Nathan, I did find the 1.1.5 factory.zip and used the clockwork RC2 from this article to “reset” it back. Once it was working again I followed this post again and she’s working! Glowlight is even working great. One thing I am worried about… Is it possible for someone to post a “hacked” factory .ZIP with some kind of spyware that would capture my personal information as I access Amazon, Google Apps, etc? Perhaps I’m just being paranoid. I’m new to this. Also, is it normal to see popup messages asking to “allow super user access” when I open some of the apps on the app tray? Thank you so much for responding to my comment. My Nook ST/G is better than ever!! The superuser dialogs are normal. You can get rid of them, but doing so wouldn’t be a great idea – you’ll only see them the first time you launch an app, if you leave the “remember this” tickbox ticked. It’s a good idea to be aware of which apps are asking for superuser rights. The factory.zip file you downloaded was posted by Dean Gibson, one of the folks I learned a great deal about clockwork from. Anything is possible, but I’d put Dean installing malware in that file extremely low on the probable list. I’d trust Dean more than myself not to miss a command and screw things up! Speaking of unknown files grabbed off the intertubes and running your device with them – have you unpacked the zip files for rooting that I posted, to confirm that at least the filenames are what I said they were? Did you read the scripts in tinynooter to be sure I wasn’t practicing malicious script-fu? My clockwork script could have pumped your nook full of parasites and it’s much more likely to be used than Dean’s factory.zip – many folks who wanted factory.zip know how to poke into a file and were looking into that file specifically to see what-all was on the glowworm. is the creation date and size on my copy of factory.zip. Thanks…what great instructions!!! Worked perfectly first time through. Any idea when Android Marketplace-Google Play will be available for the Nook STG? The first glowlight root from Gabrial D (touchnooter) is now available, with Android market support. Tried to root my Nook Simple Touch yesterday. All went fine but I could not install none of the apps I downloaded from 1mobile. Always the same error – “Parse Error. There is a problem parsing the package”. I tried to uncheck and recheck the “Allow non-Market apps” box several times without any effect. I could not install any of the applications I had on the SD card – no file browser installed during the rooting (or is there one). Rooted nook was in every other respect functioning just fine. Can somebody tell me what went wrong? I’ve rooted using tinynoot and am quite happy with it. I am just curious though, if I wanted to do the new GlowNooter would I have to restore back to the stock image first? Thanks. Yes, I would suggest restoring back to stock first to be on the safe side. Hey Nathan. Thanks for the clear directions and video. When I try to download the browser or the other apps you mention from the Amazon Appstore, they don’t appear in myapps or in the app drawer(?). A blank message pops up after attempting to install. Did you make sure to click allow non-market apps in nook color tools? In the video you unchecked Allow Non-Market Apps then rechecked it. I did the same thing and the apps still don’t download. Do you have a memory card installed? Yep, an 8GB Maxell. Every time I go to download the app, a blank message appears followed by the myapps section that is also blank. The Nook recognizes my card and I’m adding epubs as we speak. When you refer to myapps, you’re referring to the menu choice that pops up after launching the Amazon appstore and viewing only the apps tied to your account? I don’t know of a myapps section that’s available in the launcher which is why I’m trying to sound out which myapps menu you’re referring to. Has the Amazon appstore app offered to or tried to update itself? They regularly update that tool – I wonder if it needs to update on your device. My NSTG Amazon appstore is currently at release-2.6.53 and seems functional. I installed it with tinynoot, and remember that it wanted to update itself relatively early on. If I’m right that you’re referring to the Amazon appstore’s “my apps” menu, it sounds like a login problem at Amazon – if there’s nothing visible in that menu, I think Amazon doesn’t have those apps ‘on file’ for you. Have you tried logging into your amazon account on a different device, adding a free app for download to your nook device, then firing up the appstore on the Nook? From that old post you mentioned you put the Relaunch launcher (originally meant for the NST) into the Onyx Boox T68. Did you have to root it first or can you just install the APK right away? I just bought the Onyx Boox M96 Plus (9.7 inches). Previously (and still do) I have the NST BNRV300 and NST BNRV350 (glowlight) which I installed the NookManager. Do I have to all that with the Onyx Boox M96 you think? That comment was from over 3 years ago so I doubt he’ll answer back but I would definitely recommend not using any Nook stuff because when dealing with Android specialized tools and apps are rarely interchangeable between models, especially with the Nook’s ancient OS. 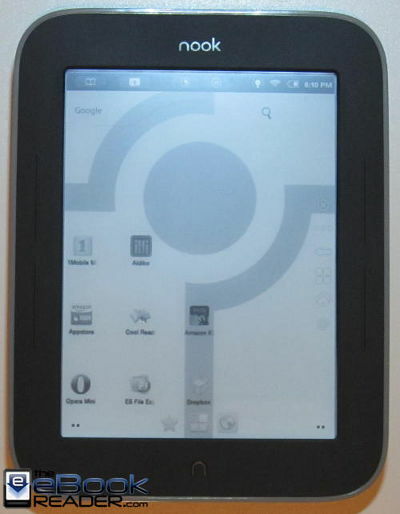 You can find info and help specific to the M96 on the Onyx Boox section at MobileRead. Oh ok thanks Nathan. Just that I noticed a post from May 2015 from roustabout in the Barnes & Noble forum that he put the Relaunch Launcher inside his Onyx Boox T68. I will certainly check the Onyx Boox section and register too. Thanks! My question is: Can I root the Nook before registering it with B&N since I live outside of US and I dont have a US billing address? Basically, can I start the rooting right after I take the Nook out of the box and will it be able to download the free B&N books after rooting? I just used a fake US billing address, and then rooted it… have u tried that? It worked for me! Is there any way that the Nook Glow might be getting USB Hostmode support anytime soon? I want to type with a really light keyboard! I know people were able to get a USB keyboard to work with the original Nook Touch but I don’t know if it’s the same for the Nook Glow (probably not). Anyway, here’s the USB host thread at XDA. how to install coolreader and other apps? So finally I can install no applications… there is any other way to instal .apk without a browser, say from the SD Card, but I have no file explorer yet….